Mani, A. Chohedri, E. Ravanfar, P. Mowla, A. and Nikseresht, A. 2018. Efficacy of group cognitive rehabilitation therapy in multiple sclerosis. Acta Neurologica Scandinavica, Vol. 137, Issue. 6, p. 589. Mosotho, Nathaniel Lehlohonolo Timile, Ino and Joubert, Gina 2017. The use of computed tomography scans and the Bender Gestalt Test in the assessment of competency to stand trial and criminal responsibility in the field of mental health and law. International Journal of Law and Psychiatry, Vol. 50, Issue. , p. 68. Rasskazova, E.I. Kovyazina, M.S. and Varako, N.A. 2016. Screening Scales in Neuropsychological Rehabilitation: Opportunities, Requirements and Limitations. Bulletin of the South Ural State University Series "Psychology", Vol. 9, Issue. 3, p. 5. 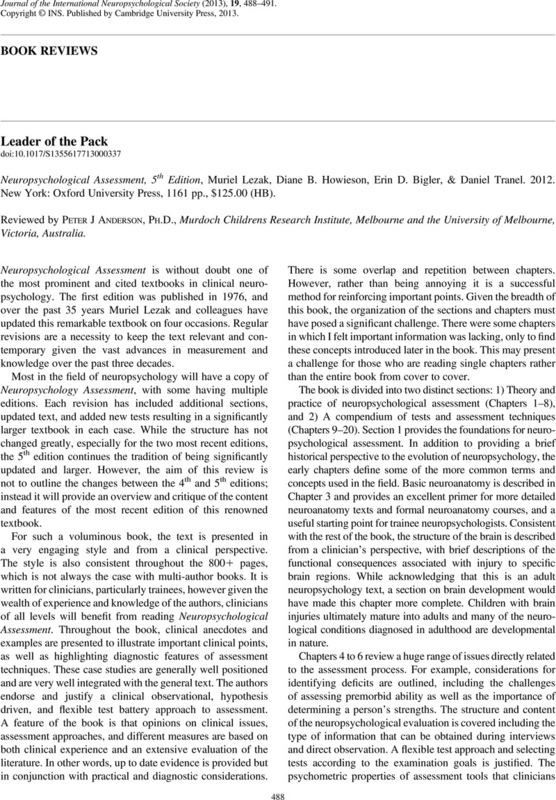 Leader of the Pack - Neuropsychological Assessment, 5th Edition, Muriel Lezak, Diane B. Howieson, Erin D. Bigler, & Daniel Tranel. 2012. New York: Oxford University Press, 1161 pp., $125.00 (HB).